‘Nocturne’ is an intriguing release, a compilation of really good concepts that never quite come together cohesively to offer a fully polished story. The planet of Nocturne itself is a military transit point at the far edge of human-controlled space during a seventy-year war against the Foucoo. The Doctor has brought his companions Ace and Hex to Glasst City on Nocturne, one of his favourite places, for some rest and relaxation, the city itself a haven for artists and philosophers in what has become known as the Far Renaissance. Unfortunately, their arrival occurs at the same time that fires mysteriously start breaking out in the city as an unnerving noise fills the air at night. Big Finish writers seemed to have a difficult time capturing Sylvester McCoy’s Doctor in the early releases, but that issue has generally been getting better with each successive release. 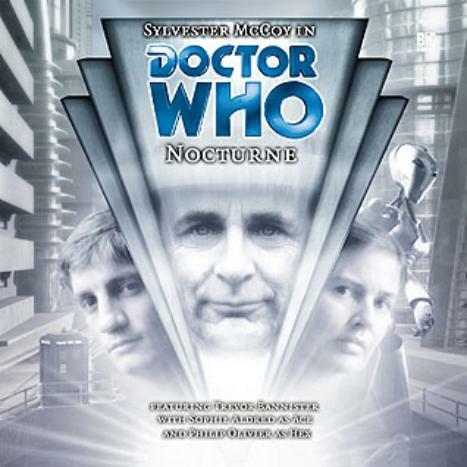 ‘Nocturne’ isn’t necessarily a misstep in characterization given the darker nature of the Seventh Doctor, but his apparent eagerness to kill the creature troubling Glasst City certainly goes against how Big Finish has written him up to this point and undermines a heartfelt confession about his laws he had made moments earlier. For all of the talk of the Doctor’s friendships with the artists on Nocturne, little work is done to actually show that, another strange inconsistency. In fact, ‘Nocturne’ is a story filled with missed opportunities like this that could have made the entire release much more satisfying and fulfilling. Events happen simply to fill time with no bearing on the story as a whole, and the villain that is so uniquely suited for the audio medium never reaches its full potential. There are some touching moments between the leads, especially between the Doctor and Ace as he comforts her after an attack and promises to be more open with information regarding where they land and what to expect in the future, but otherwise the script is filled with rather banal moments that don’t truly resonate. Hex isn’t given too much to do, mostly reacting to accusations of murder, though he does have a heroic moment where he runs into a burning building to save a complete stranger. The accusing military officer Cate Reeney, is ably played by Helen Kay, but her character is lacking a bit of an authoritarian nature that her position would suggest. Ace, likewise, spends most of her time with one character, Paul-David Gough’s soldier Will. They share some interesting stories, and Ace delves into her own past a bit as they explore Glasst Ciy together, but the romantic undertones implied by the script fail to ever fully manifest. The planet of Nocturne itself is a potentially intriguing and rich environment, but the sound effects never quite bring it to life as much as previous stories’ backgrounds. With that in mind, ‘Nocturne’ as a story filled with unexplored and unrealized aspects and a villain as well as storylines that simply don’t carry as much weight as might be intended. There are at least some decent moments of espionage, discussions about the effects of war, and realisations of family tensions in the slow-moving and padded plot; however, even the Doctor’s moments of bearing his soul are undermined by a more antagonistic and barbaric mindset at the end, finishing an uneven release that seems a missed opportunity for something much more special given its component pieces.